Enjoy the simplicity of your Smart Start program straight from your mobile device or online. Download the Smart Start Client Portal app or go online to create and manage your account. Sign up on your schedule. Whether you’re a new or existing customer, register for your Client Portal account now! Stay in control of all your Smart Start accounts remotely, whether it’s through the Client Portal app or online. 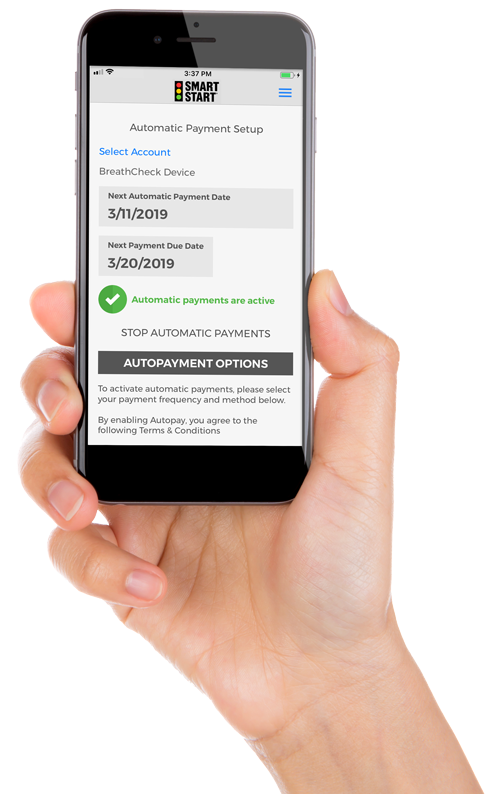 Manage Smart Start payments right from your phone with flexible pay plans and an auto-pay option. Smart Start provides a convenient and easy-to-use way to manage your account right from your phone or online. New to Smart Start? Become a client in minutes and request an installation appointment right away. As an Ignition Interlock client, you can select your preferred date and time, pick your location, and set up appointment reminders via email. Already a Smart Start client? Manage your account(s) by setting up flexible payment methods, whether you’re an Ignition Interlock, SMART Mobile and/or BreathCheck client. Under Payment Methods, you can add your card details or delete them. Your dashboard provides an overview of your Smart Start account(s) where you can quickly check your next payment due date, service date and/or upcoming test windows. Make payments, review when your next payment is due, or look up your next service appointment. Ignition Interlock clients can purchase Unlock Codes if your state allows them. Watch training videos specific to your program. Find your nearest Smart Start service center. Notify anyone monitoring your program by adding notes to your account. Read frequently asked questions about your device. Set up automatic payments for your device(s). With all of these great features, why wait? Download the Client Portal app or go online today.